This month’s new moon is on Sunday, 26 February at 9:58 AM EST/6:58 AM PST. An extremely exciting new moon because the Moon and Sun meet in Pisces, combining their energy to form “the big picture” of the year ahead. This is will and emotion working as one – something that is rather difficult for all of us on a regular basis. A very spiritual and artistic moon, your soul will glow if you tap into the smooth, sweet, dazzling energy of Pisces. This is also – The Toy Moon! I call it, the Poppet Moon (no, nobody else does – I made it up – you won’t find it in any research anywhere). I don’t know if you have ever noticed? But…Pisces People? This would include folks with Pisces rising, a Pisces Moon or Mars placed in Pisces. They almost ALWAYS love toys. And, if they don’t have toys at their fingertips? They play with napkins, pencils, stones, whatever is available in front of them. The controlled ones? They play with toys in secret so you don’t know they love toys. The type of toy can differ – some like cute little ones, others big fancy things, dolls, trains, trucks, and yes…even unmentionable toys not suited to the general audience. Which for me, converts into magickal dolls. I call it the Poppet Moon because honestly, in the magickal world the word “poppet” has more publicity mileage. Did you know that as a kid, I didn’t like dolls? That’s right! Until I figured out that they could be extremely useful in the world of manipulating energy. And then hold back! If I could make them myself – odd, strange, unusual? All the better! Toys that can WORK. I so love that. This New Moon also has a few whammies with it. It is a Solar Eclipse – so what you do? This energy stir things up for at least 6 months – work wisely. AND, the day is energized by the Moon conjoin Neptune – so what this means is that we’ve got all three The Sun, The Moon, and the Ruler of Pisces (Neptune) all playing in the same sandbox. Someone will either tell you a whopping lie (hold onto your purse strings too) or present/birth amazing artistic, musical, etc. genius (that would be…you!) Stay away (please, please, please) from drugs and alcohol all weekend. I know. Who the hell am I? Someone that would like you to stay living. You have work to do. Let’s not screw it up. Also active that day, and really, really important is Mars cojoin Uranus in Aries – so this means a wave of enormous POWER (it also means watch out for accidents and don’t do anything super stupid). Our goal is to use this amazing energy to carry a goal or project to super success! The spell for the Poppet Moon is super simple – actually, it was the information you just received that was more important. You needed that base – that knowledge of what energies are available to you – to reach out and manifest what you feel you need. Think of it this way – you are on a BIG water slide? At the top? And the magick is the ride down to the goal at the bottom. You can do this! Super simple. A raw egg (don’t break it). A toy or doll that you will carry with you for the next 6 months OR that you will place in a prominent location so that you can see it every day. Your goal written on a piece of paper – please be specific (attach this paper to the toy). Now, if you are afraid that someone will see what you have written – burn the paper and massage the ashes into/onto the surface of the toy. Marker – black or colors (your choice). A glass or bowl of blessed water. Clear your working area with a prayer, chant, holy water, incense, etc. Whatever you normally do is fine. Cleanse and bless all tools. Color the egg with the marker and set safely aside. As you color, chant your desire, it could be very simple: “Success comes to me easily” – whisper these words over the egg so that your breath touches the egg. The trick is for your breath to roll from right in front of you to out beyond you. You can draw anything on this egg — designs, pictures, words — this is YOUR spell — do as you will. 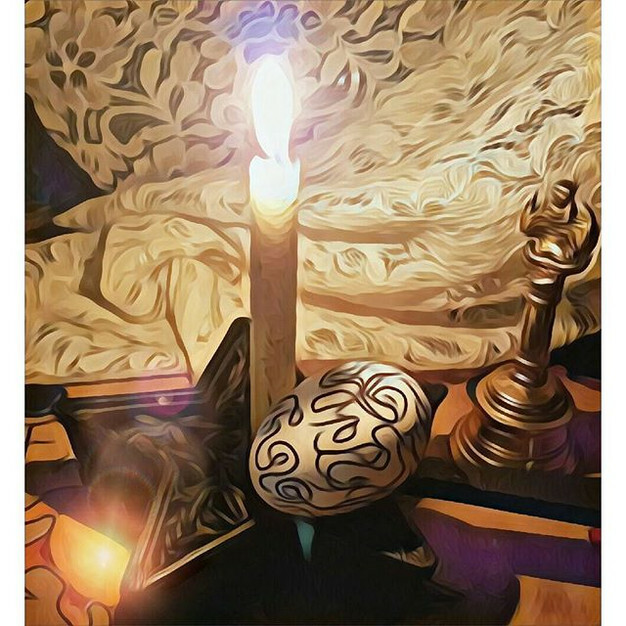 Dress your candle with magickal oil or fluid condenser (you don’t need to do this if you have my beeswax chimes) and empower your candle for success. The candle does not have to be white – that is just the color I chose. Light the candle. Dip the egg in the blessed water and blow it dry as you repeat a chant like this: “I birth success. All my actions and thoughts are tuned to happiness, joy, and success.” Yes, I know the colors will probably run. That is just fine. Pisces is, after all, all about blending – right? Once the egg is dry, set it on top of the sunflower seeds. As the candle burns, reaffirm your desire then seal the working with an equal-armed cross drawn in the air over the candle and the egg. Leave the egg there until the candle burns completely. Dip the toy in the same water, and blow it dry saying the same chant you used before. If the toy will be ruined by immersion, then sprinkle it with the water. Command the toy to assist you in attracting success. Tell the toy you will reward it with something special (pizza, chocolate, a new dress, a plastic farm house – whatever) when you receive what you desire. Tell the Universe how grateful you are that your success has come to pass. Aye-ya! Again, when you are finished empowering and directing the toy/doll — be sure to seal the working in the way you feel appropriate or by drawing an equal-armed cross in the air over the toy/doll. There is only one caution – what you promise, you must do. There is no forgetting. No, “gee, I’m sorry.” You say it? You mean it. You do it. Magick is hugely dependent on this form of honor. Inside, throw the cold candle end in the trash (if there is any). Carry the toy with you until your goal is reached (or place the toy in a prominent or honored place). When you receive your request, bless the toy and keep your word. Cleanse the toy with salt water and prayer – it can be used again. I am grateful that you took the time to read today’s article! Thank you so much for sharing in the energy! Many Blessings to you! Jupiter retrogrades on 10 April in the sign of Sagittarius, appearing to move backward until 11 Aug 2019. Regardless of Jupiter’s direction, this planet always carries the title of “the Great Benefic”. The difference with the retrograde is that the good fortune energies come from within. A Jupiter retrograde is wonderful for the soul, allowing us to heighten our spiritual vibrations, striving ever forward for healing, wholeness, and harmony. Opportunities that unfold during a Jupiter retrograde are usually the result of our thoughts, actions, and words in the past — now graciously unfolding to touch our lives in amazing ways. Jupiter retrograde also gives a window of opportunity to restore the self as well as relationships with others. This particular cycle is especially powerful as Jupiter is in its home sign, where it is most comfortable. It will absolutely want to make changes to its core. This is your chance to change to your fullest expression possible in marvelous ways! 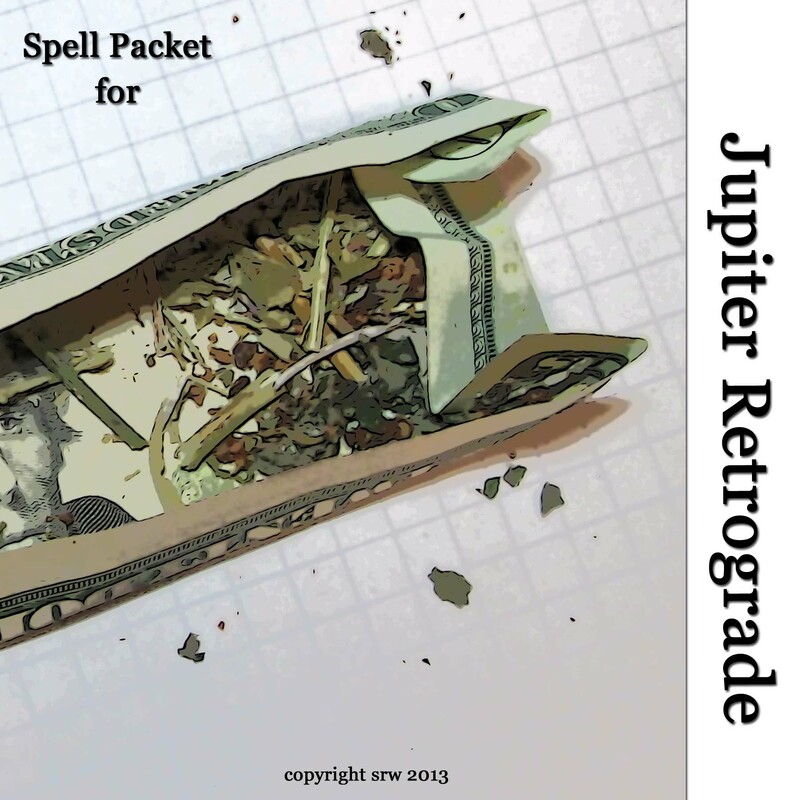 The Jupiter Retrograde Good Fortune Money Packet presented in this article is designed to guard and improve your finances, income, savings, etc., during the Jupiter retrograde period. It is very easy to make and can be put together in only a few minutes. There are seven herbs, all with Jupiter correspondences, although some of the herbs listed, like dandelion root, have dual associations. These herbs are: Sassafras, Clove, White Sage, Nutmeg, Cinquefoil, Hyssop, and Dandelion Root. In a Jupiter planetary hour, blend the herbs together in a small bowl, whispering an affirmative statement of your choice. If you are lucky enough to have a three-pronged dandelion root — leave it as it is to include whole in your packet. Use the highest denomination of paper money you have in the house to make your packet. Fold the top of the bill down, and the sides in — as shown in the picture. Place your herbs and the dandelion root on the money. Blend the energies of the herbs together by softly blowing on them — visualizing them awakening and blending to your purpose. 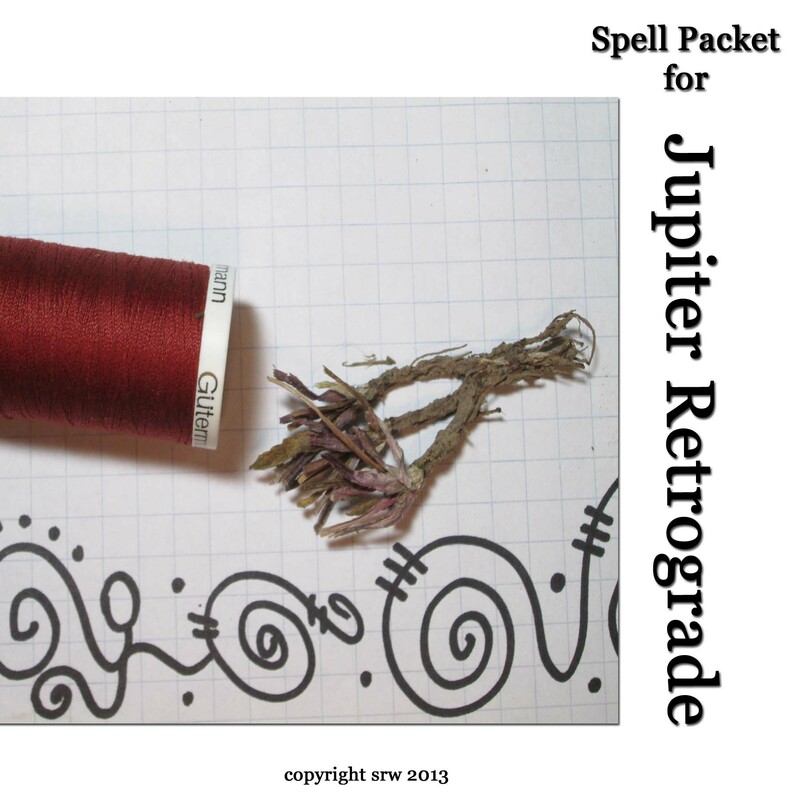 After you have folded and wrapped your packet with the red thread, dress your money packet with Jupiter Oil. 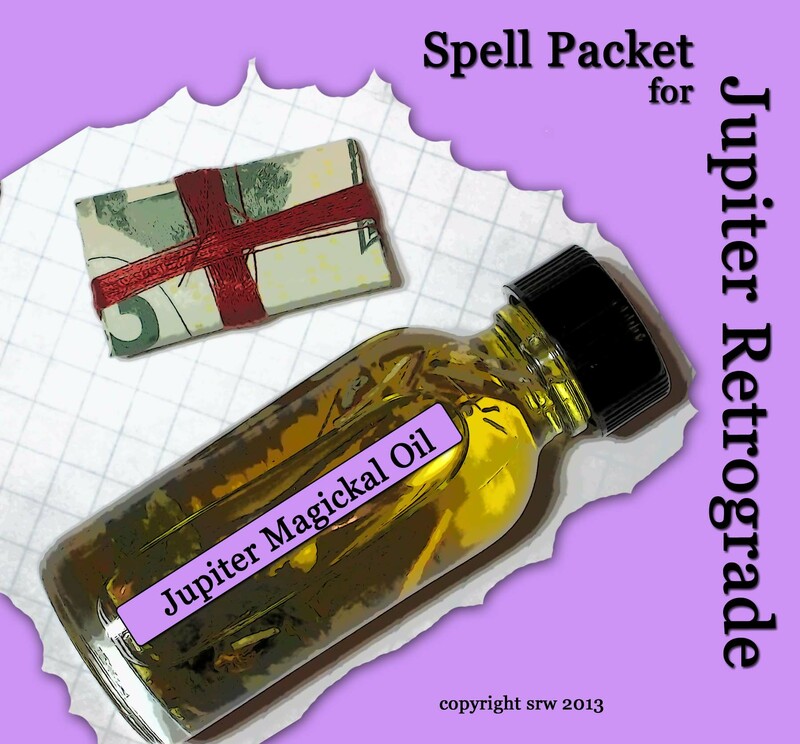 If Jupiter Oil doesn’t feel right to you, use an oil or perfume of your choice. The oil pictured below includes the same ingredients as the money packet, with the addition of Jojoba carrier and Honeysuckle fragrance. 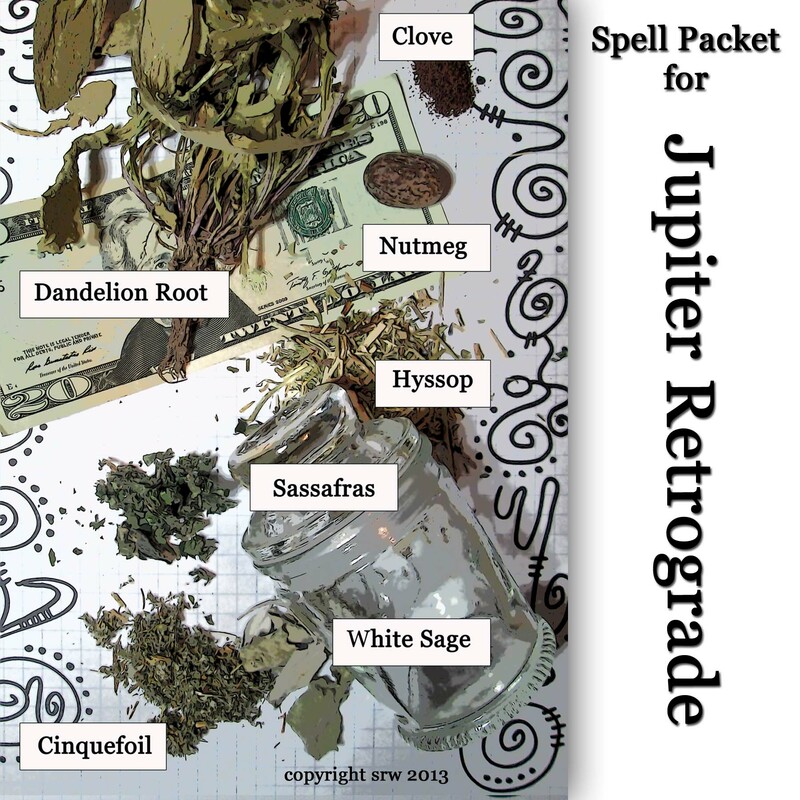 You can add additional spellwork, such as a ritual of your choice, or you can simply secret your packet away in a drawer, special money box, a money jar, or in your wallet until Jupiter turns direct in August. At that time, open the packet and scatter the herbs to the wind, thanking the spirits for your protection and good fortune. You can spend the money, give it to charity, or purchase something nice for a friend or family member. You can hand roll a Jupiter Candle — beginning with an orange core for opportunity cloaked with a purple outer covering. Orange and Purple are Jupiter colors, vibrating to opportunity and the greatest good. I dressed my candle with three magickal powders — Jupiter, the Sun, and Venus. I also used Universal Fluid Condenser to ramp up the power (You can find instructions for these formulas in my Witching Hour book). I can burn the candle either on a Jupiter Day in a Jupiter Hour before the retrograde — or I can place the candle on top of my spell packet and burn the candle as Jupiter stations and turns retrograde — which is 10:01 AM Pacific time on the 10th/ 1:01 PM Eastern Daylight. I could wait and burn the candle mid-cycle when I’m feeling a little nervous if something appears to be stalling that I need (again using the Jupiter Day and Jupiter Planetary Hour), or I could burn the candle for slingshot magick (my term for doing magick as a planet stations and turns direct) on the 11th of August at 6:37 AM Pacific Time/ 9:37 AM Eastern Daylight Time. This Jupiter retrograde, embrace the benefits of spiritual growth and the recognition and appreciation of your power and creativity within. With every step, walk with delight toward your goals! May Harmony embrace you each and every day!